It is well documented that psychotic disorders are linked with significant long term physical health conditions and reduced life expectancy of 15-20 years below the general population. Cardiovascular disease, weight gain and obesity and diabetes are the greatest contributors to this reduction in life expectancy. In partnership with the AHSN, Time4Recovery and Livefit, Berkshire’s EIP Service have developed a pilot intervention aimed at reducing health inequalities experienced by clients with a focus on improving diet, increasing physical activity and promoting recovery through social inclusion and engagement. 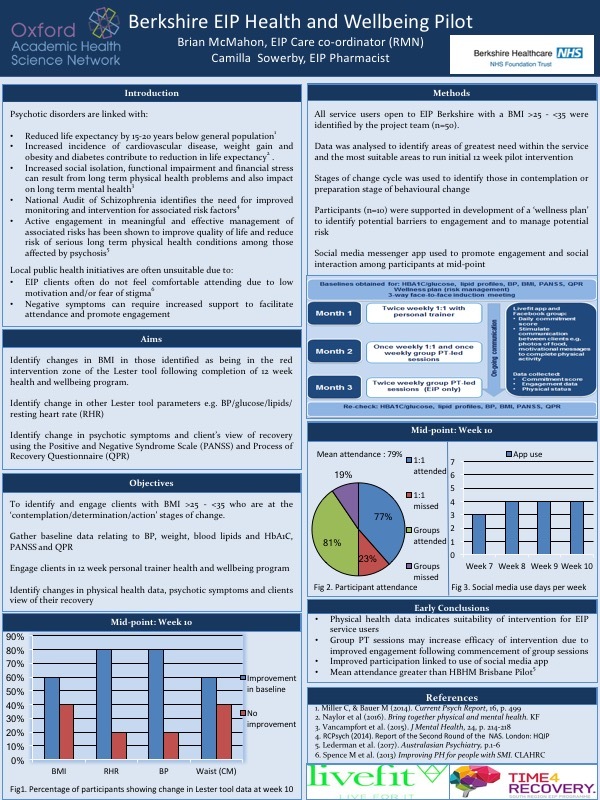 The pilot was led by Brian McMahon (Mental Health Nurse and EIP Care Co-ordinator) and Camilla Sowerby (EIP Pharmacist) who both oversaw the development and implementation of the pilot and recently showcased this at the Royal College of Psychiatrists International Congress in Edinburgh. A total of 10 participants with a BMI >25 were included in the initial pilot which was implemented across two localities within the Berkshire EIP service. Each participant was identified as being in the contemplation or preparation stage of change prior to inclusion and was then allocated to their own qualified personal trainer (PT). Over the course of 12 weeks each participant engaged in initial 1:1 sessions with their personal trainer, before gradually progressing towards group sessions led by a trainer and involving other participants within the pilot. Not only did participants increase their physical activity as part of the pilot, they also received specialist dietary advice and habit coaching from the Livefit team. This was delivered via the Livefit social media app that also aimed to stimulate conversation and communication between participants. Participants were encouraged to share images of prepared meals and to provide commitment scores based on their dedication to their individual health and wellbeing plans. Although not all results have been collected we are certainly excited by some of the early data. 80% of participants recorded an improvement in baseline data in resting heart rate and blood pressure. While 60% recorded a reduction in Body Mass Index (BMI) and waist circumference. Mean engagement was recorded at 79% which is greater than other leading interventions in this area such as the ‘Healthy Body, Healthy Mind’ pilot in Brisbane, Australia. Overall engagement improved as group PT sessions commenced this also coincided with an improvement in physical health data which indicates the effectiveness and increased efficacy of group led interventions. The use of the social media app also increased as the pilot progressed with a number of participants accessing this and communicating with each other on a daily basis. .